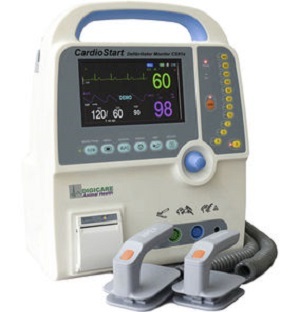 These units are often used by the healthcare providers to diagnose a cardiac condition. The healthcare provider will decide what charge to use and will deliver the shock through paddles or pads on the patient's chest. These units are generally found in hospitals. They are identical to the external version except the fact that the charge is delivered through internal paddles in direct contact with the heart. They are found in operating theatres where the chest is likely to be open. These are simple to use units based on computer technology which is designed to analyze the heart rhythm itself and then advise the user whether a shock is required. The automatic units also take time to diagnose the rhythm, whereas a performer with a manual unit can diagnose and treat for the condition far more quickly. So the speed is less in an AED. Automated External Defibrillators are generally held by a trained personnel .Public access units are also available. 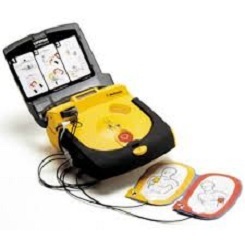 An AED is external because the operator applies the electrode pads to the bare chest of the patient. Automatic refers to the unit's ability to automatically analyze the patients's condition and to assist this, some modern AEDs have visual displays to instruct the user. When turned on or opened, the AED will instruct the user to connect the pads to the patient. The pads allow the AED to examine the electrical output from the heart and determine if the patient is in a shockable rhythm. If the device determines that a shock is warranted, it will use the battery to charge its internal capacitor to deliver the shock. This system is not only safer, but also faster. These units are a compromise between a fully manual unit and an automated unit. Semi-automated External Defibrillators are usually mounted in an ambulance. These units are designed for use only by healthcare personnel and are capable of measuring blood pressure, blood oxygen saturation etc in addition to the basic function. It is also known as Automatic Internal Cardiac Defibrillators (A I C D). These devices are similar to pacemakers. They constantly monitor the patient's heart rhythm and automatically deliver shocks for various life threatening heart problems. The device is programmed to act according to the heart condition.